National Left: Will there be no point in voting for council on local issues. Will there be no point in voting for council on local issues. With Welsh Local government elections not due until 2022, if our local councils are intent on raising extra revenue, then it would be probably in their interests to make any large rises in council tax in the next two years. After all it would be unwise to make a substantial increase in 2021 a year before council tax payers go to the polls. Similarly those councils, who wish to avoid rises face the possibility of cutting jobs and expenditure. Pembrokeshire faces another inflation-busting increase in council tax or big job cuts, councillors have been warned. Finance director Jon Haswell said council tax would need to rise by 28% to meet service needs in the wake of a 0.4% cut in Welsh Government funding. Bob Kilmister, the cabinet member responsible for finance, said the picture looked "pretty grim". Last year Pembrokeshire's council tax went up by 12.5% - the first double-digit increase in Wales since 2004. However, council leaders defended it by pointing out it was still the lowest council tax in Wales. At an audit committee meeting on Thursday, Councillor Jacob Williams asked Mr Kilmister if the authority had a plan for "mass redundancies", according to the Local Democracy Reporting Service. Mr Kilmister said he could not answer with "any clarity" until council officers gave their assessment of service priorities, but warned the status quo was "not an option". "There's no way in we can meet the budget requirement we have got without affecting the number of people we employ," he said. "Have we got a clear, costed plan at the moment for that? No. Mr Haswell warned that on current predictions, based on the Welsh Government's standard spending assessment of what it thinks the council needs, council tax would need to rise by 28% unless services were cut. "It's more difficult than last year," he said. Mr Kilmister added: "We might possibly be in a better position than some others but it's still pretty grim." The Isle of Anglesey, Conwy, Flintshire, Powys, Monmouthshire and Gwynedd are the worst hit. Only Flintshire is Labour led. Cardiff will see the greatest cash increase, at 0.4%, while Merthyr Tydfil and Rhondda Cynon Taf will see a 0.3% increase. Across the boarder in England n Northampton Tory government cuts had driven this Tory council to issue a section 114 notice — the nearest thing to bankruptcy for a local authority, which by law are not allowed to actually declare themselves insolvent. Whilst Now it seems, just as I predicted, that another Tory council, Torbay in Devon, has run out of money too. Council tax funding is collected by district councils and unitary authorities. County councils also set an amount (a ‘precept’) that is collected alongside this as part of council tax. Police and fire authorities, and transport authorities, also collect shares. Each council keeps all of the council tax revenue that it collects (none is redistributed between councils). Since 2012, councils have not been able to raise council tax by more than a set level each year without a referendum approving the rise. In the last three years this level has been 2%. Before this, there was a system called ‘capping’, where the government would decide each year to stop particular councils increasing their council tax by too much. Under the Cameron-Clegg coalition, this was changed. Councils can raise the level of council tax as they wish, but must hold a local referendum on the matter, if they wish to raise it above a certain threshold set by central government, currently 2%. I must admit that unless there is a substantial rise in UK local government payment to English councils and an increase in that paid to the Welsh Assembly and Scottish Parliament can choose to pass it down to the local authorities, there doesn't seem to be any solutions. 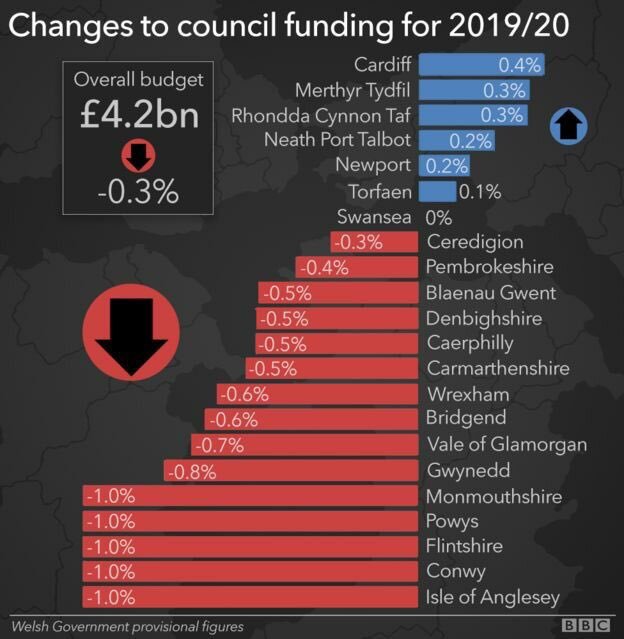 Lets face it it would be very unlikely that residents would back a substantial rise above 2% in their council tax in a referendum and a rise by 28% to meet service needs that Pembrokeshire has claimed it would need to avoid cuts would be impossible. The reality is that Central Government of either colour , don't care about local councils and are not even concerned about their make up having emasculated them with tier caps and continuous reductions in funding in real terms. They are not even concerned about the political make up and the fact e will probably never see a return of the likes of Ken Livingston's GLC or other radical councils who believed they could make radical changes. Unless there are major changes in funding and the way they raise their own revenue, then there will be no point in voting for councillors on local issues but only on "National" lines and that suits the Tories and indeed Labour just fine. With the Cabinet system yor local Councillor is more often than not on a three line whip or otherwise has to toe the Party line.This even applies to Independent Councillors. Mr Bumble the Beadle appears in the Assembly. Pork Barrel Politics in Welsh Council funding? Should we have a Universal Sign Language? Will Austin Martin be another Circuit of Wales?